Tax Day falls on Monday, April 15 in 2019. Usually, this is a day filled with money stress — at least for those who wait until the final day to file their taxes or pay their IRS bill. However, there are also some exciting Tax Day deals and freebies if you know where to look. Here’s how you can save some money on Tax Day specials and sales in 2019. 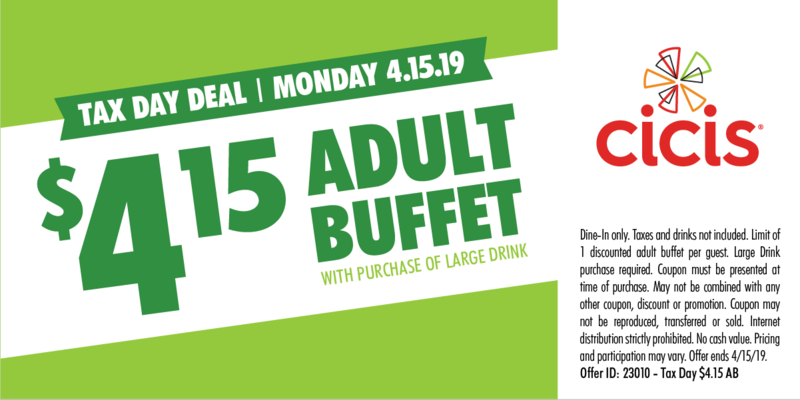 There are a surprising number of restaurant deals on April 15, 2019. If you need a chance to de-stress and would appreciate a nice meal, snack, or beverage, here are some options to check out on Tax Day. There aren’t as many retail deals for Tax Day. Usually, retailers focus on holidays, and April 15 is more like a deadline. 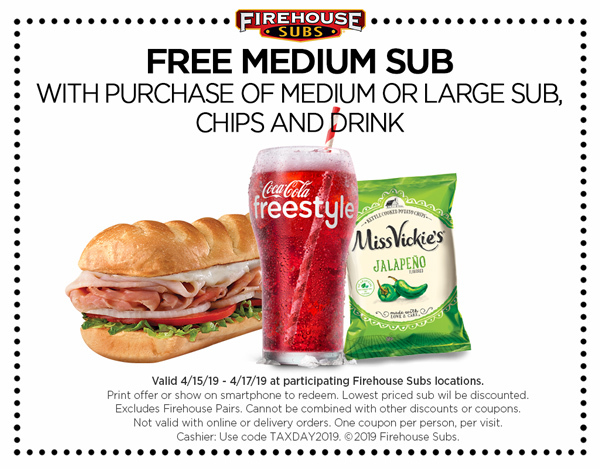 However, that doesn’t mean you can’t find a great Tax Day deal or freebie, including those listed below. You may be surprised to learn that there are travel deals available on and around Tax Day. If you want to take a trip soon but haven’t started booking your accommodations, here are some deals to look into this April 15. Orbitz: Sign up for Orbitz Rewards and book a hotel or vacation package on April 15 and the company will refund your sales tax as Orbucks Rewards points when you head to this site (which will be live on April 15). While there is no guarantee that the above restaurants and retailers will offer a deal on Tax Day, it could be worth keeping an eye out. Usually, information about the specials and sales is available on company websites and social media accounts. Additionally, email subscribers might receive notification directly. With a little planning, you can easily take advantage of several of these Tax Day deals. If you find yourself near a participating location, consider stopping in so you can enjoy the freebies and discounts. Do you know of any other Tax Day deals and freebies people should know about? Share them in the comments below. While filing your federal taxes on time is ideal, sometimes being late is unavoidable. Usually, this means dealing with fees like failure-to-file or failure-to-pay penalties. However, while you might imagine the Internal Revenue Service to be unforgiving, that isn’t always true. There are certain situations that even the IRS will accept for filing taxes late. If you have a long-term health issue, particularly chronic or mental illnesses, the IRS may waive any penalties. You can increase your odds of avoiding additional fees if your condition causes issues with either short-term memory or the ability to concentrate. Late tax filers who want to use this excuse, should know that the IRS might ask for proof of your medical situation. Typically, this could include hospital records or a letter from a qualified physician who can attest to your health state. Everyone gets overwhelmed at times. If genuine feelings of anxiety make it impossible to file your taxes because of extreme fear. The IRS might be surprisingly understanding. Like prolonged health issues, you can’t use this excuse without some real proof. Since it is mental health related, a letter from a medical professional is likely a must. If, for example, there was a burglary and the thieves stole your computer with all of your documents, the IRS may waive any late filing-related fees. You will need something formal to present that shows you were the victim or such a crime. You should obtain a police report. Otherwise, the IRS may not accept this excuse. Similar to stolen records, if you’ve lost tax documents in a fire or natural disaster, you might be able to get a waiver of the fees for filing late. Additionally, if a large-scale natural disaster made it impossible for you to file on time, regardless of whether you had your records available, you might also be able to file late without a penalty. Those who have recently lost a loved one may be able to file their taxes late without a penalty. Typically, you can only cite this as a reason for not filing on time if the person who passed was a very close family member. Additionally, you might have to submit proof that the person died, like a death certificate. The IRS may waive any penalties for other reasons as well, as long as the IRS deems the cause reasonable. Note that the IRS will examine each situation on a case-by-case basis, and will carefully consider any justification for being late. However, even if you feel the cause is reasonable, it does not mean the IRS will agree. It is ultimately the IRS’s decision. People have used some interesting approaches in an attempt to get out of filing their taxes or filing late. While the IRS does understand that some things in life are outside of a tax filer’s control and will try to be lenient, some excuses are practically guaranteed to fail. For example, trying to claim that filing taxes is against your religion is not going to work. All individuals who earn an income have to file and pay any taxes owed, regardless of their religious preference. Similarly, claiming ignorance will not do the trick either. Whether you understand the tax law is irrelevant as far as the IRS is concerned, so saying that you didn’t know what you were supposed to do is not going to get you out of any penalty fees. You also can’t blame your tax preparer if your taxes are late. Ultimately, making sure you’ve filed your taxes on time is your responsibility, so you can’t just pass the buck because you use a person to make sure your taxes are correct. On a positive note, if you have never been late filing your taxes before, you may be able to get the fees waived as part of the First-Time Penalty Abatement policy. Essentially, it serves as a possible “get out of jail free” card that you can use once during your lifetime, showing that even the IRS can forgive a person for making a mistake. However, there are some requirements. For example, you need to have no penalties for the three tax years prior, have paid or arranged to pay any taxes that were due, and otherwise be up-to-date with your filings. Ultimately, there are some reasons that the IRS will accept as a reasonable excuse for not filing on time. But, ideally, it is better to avoid filing late in the first place. If you know you’ll be late, consider requesting an extension. If approved, you could get an additional six months to file, allowing you to avoid the failure-to-file penalty at a minimum. Have you ever had to file your taxes late? Share your experience in the comments below. When Is the Last Day to File Your Taxes? If you haven’t done your taxes yet, you may be a bit worried about how much money you’re going to get back in your refund this year. There were a lot of new tax changes that affected the average 2019 tax refund. Moreover, there are a lot of tax myths related to those changes. As a result, it’s easy to feel confused or overwhelmed by this year’s taxes, unsure of what kind of return you’re likely to see. The Tax Cuts and Jobs Act (also known as the Tax Reform Bill) went into effect with 2018’s taxes. There are quite a few changes. However, overall, they tend to have the effect of financially benefitting lower-income and middle-income individuals and families. Thanks to changes in standard deductions, as well as various changes to tax credits, these individuals should be able to keep more of their money than ever before. Are Tax Refunds Smaller This Year? Many people are concerned that their tax refund will be a lot smaller this year despite the financial benefit of those reforms. That’s because much of the benefit comes throughout the year, rather than at tax time. People get the chance to take home more of their paycheck rather than paying as much in to taxes. Therefore, they get to keep more money, but it’s spread out throughout those paychecks, which means that the lump sum refund at tax time may be smaller than it was in year’s previous. Some people don’t like this. Even though they get more money, they like the chance to get a big refund. They count on that to pay off debts that accrued since last year or have enough cash for a nice summer vacation. Of course, if you save regularly throughout the year, then you still have that money. However, if you are in the habit of relying on that annual refund, you might have some anxiety that it could be a lot smaller refund this year. Don’t worry. Even though many sites have reported that refunds will be smaller than usual, the newest data suggests that is not the case. People who have already received their refunds tend to report that they receive the same, or even more than years previous. This has been a surprise to many filers. Of course, you won’t know what your own return will be until you run the numbers to file your taxes. Every situation is unique. Credit Sesame recently published data showing the average tax refund for each year from 2010 – 2019. (Of course, the 2019 data is for 2018’s taxes, filed this year.) They drew the data using a survey from IRS.gov taken in the first few months of 2019. They surveyed 1500 people to get the average for this year. Naturally, the average for the year may change as more and more people finish filing their 2018 taxes. According to this date, the lowest average amount over the past years has been $2651 in 2013. The highest average return is $3068, which is the average tax refund for 2019. In other words, despite all of the rumors, and the changes in tax laws, the average 2019 tax return is the highest amount it has been since at least 2010. This is a small increase over last year. The 2018 average tax refund was $3046. So, on average, people are getting back over$20 more this year than last year when they get their tax refund. In all of the previous years, except back in 2010, the average tax refund was under $3000. Therefore, most people have found that they’re getting back more than they expected and more than they are used to. Of course, people’s incomes vary widely. Therefore, tax refunds are also very different. Just because the average refund for 2019 is $3068 doesn’t mean that’s what you personally are going to get back. Only you can find out exactly what that number is. However, you can get a more accurate sense of your likely tax return this year by looking at the average tax return for your generation. The Silent Generation will get the least back this year. On average, they will receive a 2019 tax refund of $1648. This makes sense because the people in this older generation who are still working may only be working part-time. If you don’t earn a lot, then you don’t owe a lot, but you also don’t get a lot back come refund time. The next-oldest generation is the Baby Boomer generation. They are getting the most back this year. Their average 2019 tax refund is $5403. Those Baby Boomers who are still working are probably in fairly high-paying jobs, having worked their way up throughout their whole lives. Additionally, they may have a number of dependents, including children as well as their own aging parents. As a result, they get back significantly more than the other generations do. Of the younger three generations, Generation X is getting the least back this year. With an average tax refund of just $2021, they aren’t getting back much more than the Silent Generation is. Millennials fare a little bit better with an average tax refund of $2565. Generation Z is getting the most back besides the Baby Boomers; they have a 2019 average tax refund of $3703. One of the most interesting things to come out of this tax refund survey is about how people are choosing to use those tax refunds. More people are choosing to put their tax refund into their savings accounts. In 2018, about 41% went to savings. In contrast, 50% is going to savings this year. More and more people are recognizing that they need to plan for their financial future. In fact, other than savings, the biggest chunk of tax refund money is going to pay down debt. People are spending a little bit less on everyday expenses and other random things than before and slightly more on home improvement, which can improve the financial value of the home. People understand that they should put their tax refunds to work for them. Why Is My Tax Refund Smaller This Year? How Do You Get a Hold of a Live Person at the IRS? One of the biggest points of confusion about the Tax Cuts and Jobs Act concerns was when the changes would take effect. That’s one of the myriad questions that have both taxpayers and accountants placing more calls than ever to the Internal Revenue Service. So you want to get a hold of a live person at the IRS. Well, how do you do that and how much time do you have to wait? If you don’t have time to wait, well, you might not need to. You can check the status of your tax refund by visiting the secure page on the IRS website. The agency says that it issues nine out of 10 taxpayers’ refunds within 21 days of filing and the earlier you file, the sooner you get that refund. Still want to try to get a hold of a live person at the IRS? Well, the average wait time to get a hold of a live person at the IRS supposedly lasts only 15 minutes, but some extensions may have much longer wait times. Wait times are also longer on Monday and Tuesday, during Presidents Day weekend and the month of April. Although the IRS website states that wait times are nearly double this amount of time during the off season from May to December, what that actually means is that the agency has dedicated fewer customer service agents to handle calls at those times. That said, the IRS staffs its hotlines with customer service representatives from 7:00 am to 7:00 pm local time. Once you key in your identification number, you are queued accordingly, except that callers from Alaska and Hawaii are asked to follow Pacific Standard Time, and agents serving Puerto Rico only serve from 8:00 am to 8:00 pm in that time zone. Before you pick up the phone and start dialing the IRS, know in advance that the phone system will try to steer you toward an automated voice response unit if you choose the menu option for refund information. Instead, select option 2 for personal income tax — when you’re calling the consumer line, that is. Speaking of which, people complain of getting busy signals when calling the IRS, and the official word on that outcome is to check whether you’re dialing the most current phone number for the agency. Numerous websites list outdated numbers, so instead of phoning one of those, try calling one of the numbers listed below. Is It Even Possible Talk to a Live Person at the IRS? Meanwhile, you might be able to book an in-person appointment at a local office of the IRS. This is the kind of thing you might do if you want to set up a payment plan to take care of back taxes. Some locations have walk-up windows but during tax filing season, the wait time can be daunting. One aggressive tactic: Get to the office location two hours before opening time and you can be one of the first in line to see someone in person. Find an office near you by using the Taxpayer Assistance Locator tool on the IRS website, and then call 844-545-5640 to schedule an appointment. If you’re feeling frustrated over how difficult it can be to get a hold of a live person at the IRS, maybe what you actually need is a type of middleman: Hire an accountant if you haven’t already, and hopefully you’ll be able to get through to him or her in a timely fashion. Readers, have you tried to contact the IRS about your taxes in the past — and if so, how did it go? What questions are confusing you this tax filing season?